Nick and I have done a fair amount of tromping around in the Sky Pilot group. It’s not exactly an alpine wonderland but it is easily accessible and hosts a wide variety of adventures in tons of combinations pretty much year round. 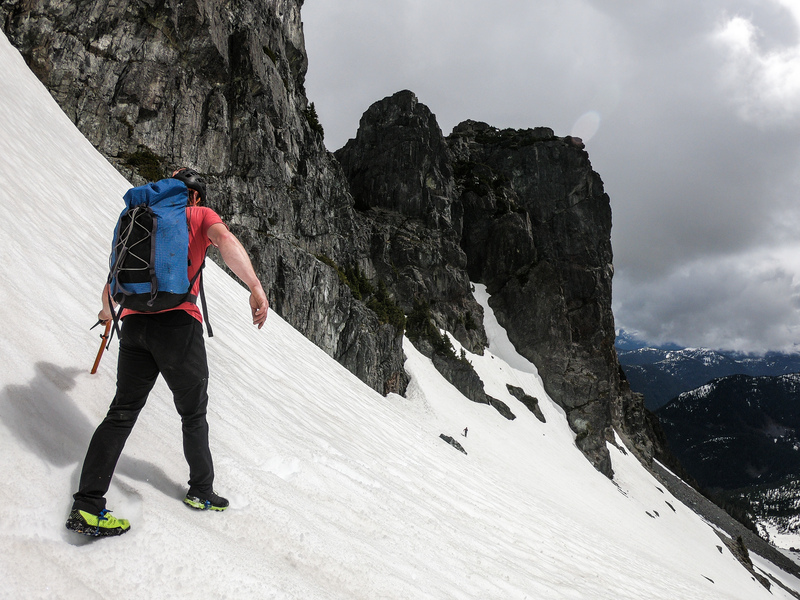 We’ve slowly been working our way around the area, ticking off summits and exploring the valleys and ridges. 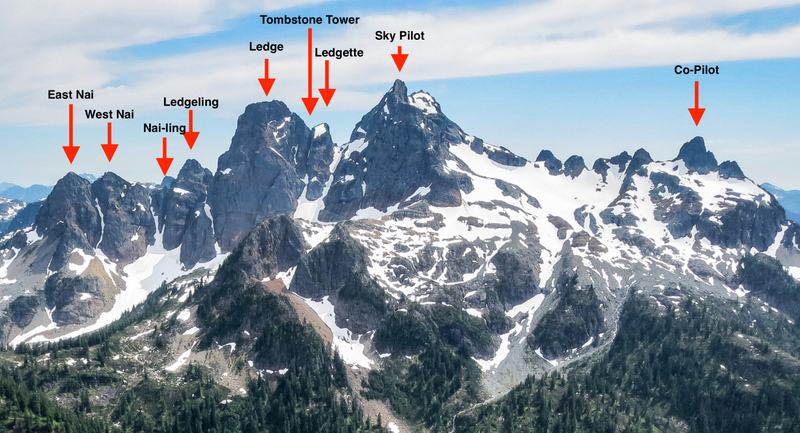 The peaks around Sky Pilot present themselves quite nicely, especially when looking from Mt. Habrich, across the valley. They sit in a nice row, silhouetted against Howe Sound and the North Shore in a logical line. 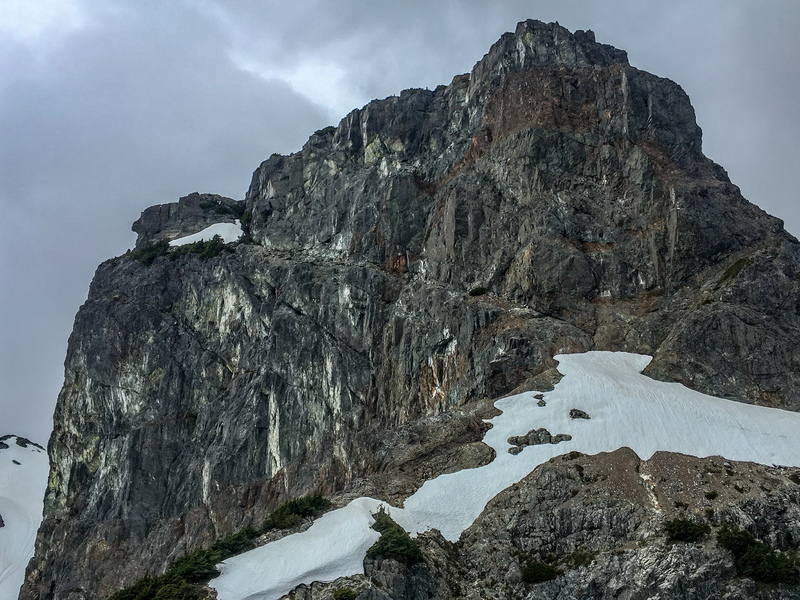 Over the last few seasons, I’ve climbed the majority of the peaks in the range in summer or winter but there were two holdouts that I hadn’t tagged yet. 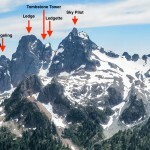 Collecting lists of peaks to climb seems to be a natural activity so I decided I needed to tag my last two. I knew that at least one of them required some moderately challenging rock climbing so roped Kelly into the idea. To sell it though, I proposed a traverse of the group. We’d tag all the peaks in one go, as quickly as we could. Nick was of course an easy sell to come along as well even though he had just bagged his final peak in the group a week earlier (possibly spurred by my mention of getting close 😛 ). We drove up the Gondola access road to get an earlier start and were well on our way by 8am. It’s not the most exciting hike to treeline but with three of us chatting, it went relatively quickly. We hit snow and made our way over to the base of Co-Pilot where a healthy snowpack meant we didn’t have to worry about half the first pitch and after a jump across the moat, started scrambling up. The gully on Co-Pilot is generally pretty loose so we took our time heading up and then took advantage of the rappel anchors for descending. Kelly looking psyched to be on Tombstone Tower! A quick traverse across the top of the Stadium Glacier brought us to the West Ridge of Sky Pilot. We scrambled up and dropped our packs midway before tagging the summit, what would be the easiest but tallest of the day. 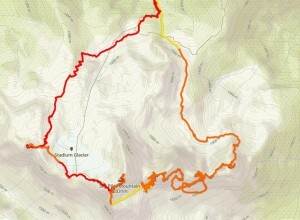 We retraced our route back to the packs and then down climbed the South Ridge. 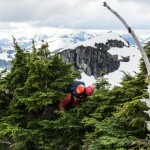 This is a nice 4th class scramble that takes you to the headwaters of Marmot Creek. 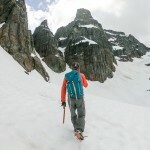 We traversed a snowfield below the South Face of Sky Pilot to the back side of Gunsight Gap. 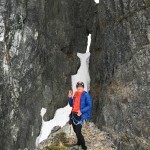 Below the couloir, we climbed up to the convoluted col that separates Tombstone Tower from Ledge and Ledgelette Mountains. Nick racked up and started up the South Arete of the Tower. He was feeling fairly confident as the week before, he had (probably) completed the first free ascent of the pitch. One that originally required a shoulder stand and some aid climbing! I was a little hesitant about my ability to make the moves but Nick put us on belay and with some encouragement from Kelly, we were at the top in no time. While we were on the summit, snow started to fall lightly and all our fingers were quite frozen. Nick descending the Ledge Route on Ledge. Easy but big exposure. After descending to the col, we climbed two more pitches up the Window Route on Ledgelette (summit #3) and then rappelled back to the giant chockstone ledge that forms the window. From there, another easy but very chossy pitch took us to easier ground on Ledge. It was cool to pass a variety of old climbing relics from early ascents of the routes, now beefed up with some modern gear. Summit #4, Ledge Peak, is presumably named after the standard route up the South Face, a giant, downsloping, gravel covered ledge. It’s rather intimidating to walk down, knowing the incredible exposure of the cliff below, even if it is relatively easy walking. Nick was big talk about it being so easy it could be done with hands in pockets but we were all seen clinging to the upper wall once or twice. A bit bushy on the Nai. We dropped back to the basin to the south (Sky Pilot Creek?) and wrapped around to the next peak and my other unclimbed summit, Ledgeling. It’s not a very aesthetic line but rather a bunch of thrashing around in bushes to a sandbagged “3rd class step” and then easy scrambling to the summit. We went as quick as we could and were soon back plodding towards the Nai. 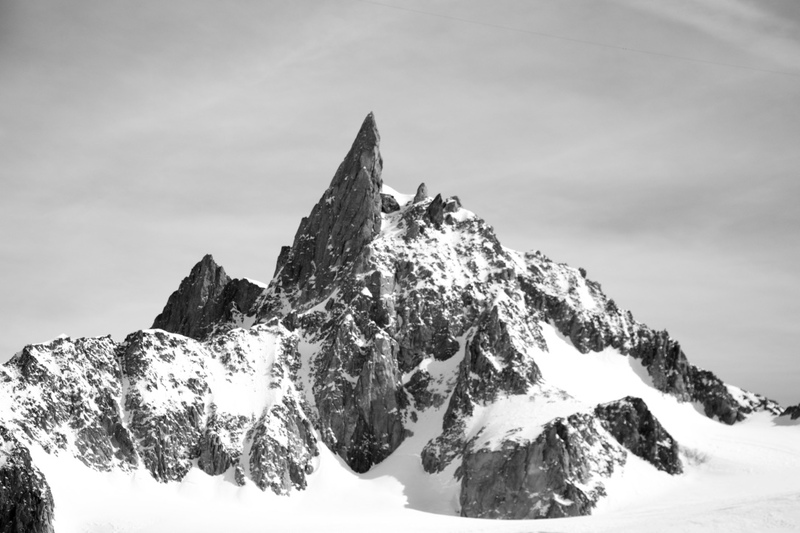 We knew we had to head to the next col over but several false couloirs got us a bit confused despite “knowing the area like the back of our hand”… We ended up at a col below a peak but the terrain didn’t match what we remembered on the West Nai. The Ledge cuts across from the top left to bottom right of the South Face of Ledge. 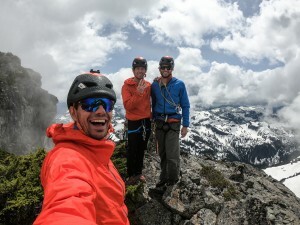 We decided to go for it regardless and climbed a 30m pitch of 4th class and then some easy scrambling to the summit where we realized we had climbed one couloir too early and tagged an unnamed summit that we dubbed the Nai-ling. A quick descent brought us to the proper col and we set off up summits #8 and 9, West and East Nai. Neither offer any particularly remarkable climbing but both have significant bushy sections that require full engagement. Needless to say we were happy to dispatch them quickly. 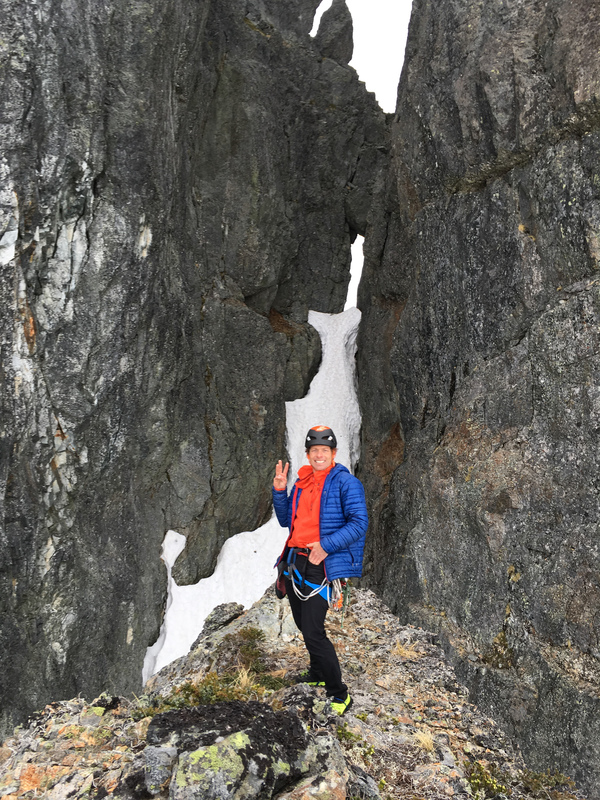 We put on crampons at the col above the Nai Couloir and stepped our way down into the Ledge Basin and around to the avalanche path that drops down to the Sky Pilot Trail. Easy snow travel back around the Ledge basin. A little jog down the road and we were back at the car in a little under 11hrs after tagging nine mostly-distinct peaks, climbing 2100m, and five pitches of roped climbing. All the peaks are certainly worth a visit and the Window Routes on Ledgelette and Ledge are particularly unique. We were particularly lucky to have swirling fog and snow to add to the ambiance. Maybe with a little more traffic, some of the loose rock will get cleaned off but it is a bit of a haul to get out there for minimal actual climbing. While I wouldn’t be surprised if someone had tagged all the peaks in the group in a day before, it was fun to do them in a nice, efficient style. Ziplongs to stay warm at belays. UD SCRAM Pack – more details on this coming soon – it is amazing! Standard NE gully route. 3rd class up. 4x25m rappels to descent. 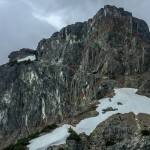 Climb snow or scree gully to north edge of tower, traverse along a ledge to the south edge. 5.9+ face moves on the left side of the overhang lead to a 5.6 arete. Small cam to protect the anchor. Short/thin knife blade to protect first move w. Tiny nut to back up. 30m pitch. 30m rappel to descend. North edge (corner) pitch sustained 5.9 with some loose rock. 45m. From snow or gravel tongue in the window, climb up a corner/face (5.7) on the left for 25m to a ledge with an anchor of the left or right to a ledge on the chockstone. Continue up a 5.7 face to the top with a multi slung block anchor. 2x 30m rappels to the notch. From the window chockstone ledge, step down left (past an anchor) and start up a left leaning groove until a short step up right into a groove going up to a mantle move onto a bushy ledge (4th to low 5th class but loose rock). Continue on to a bigger bush with many slings for an anchor. 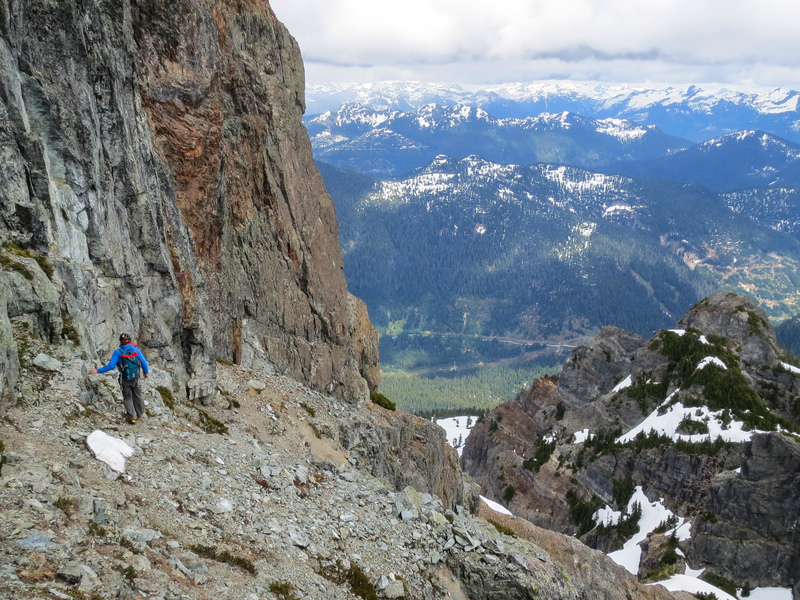 Wander up heather ledges and rocky sections to the summit of Ledge Peak. Descend via the Ledge Route. Drop SW through thick bushes and heather to a notch in the ridge. From the notch you should be able to make out the large downsloping gravel covered ledge. Short sections of snow/bushwacking lead to the ledge proper. Stick as close to the left wall as possible for the easiest climbing. 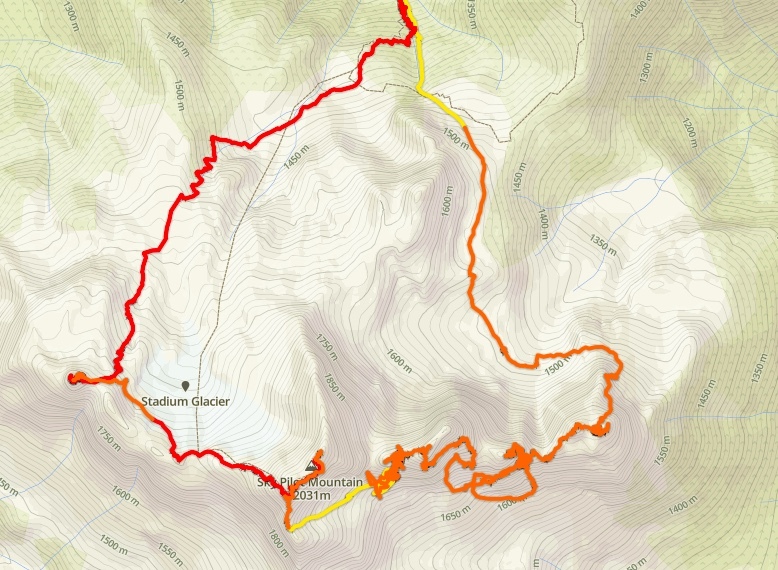 Mostly easy but a few sections with big exposure on gravely rock. Continue down scree slopes below the S face of Ledge. From snow/scree slopes below ledge, traverse skier’s left to the next couloir. Ascending the couloir to the col gives access to the W. Ridge route (4th class). 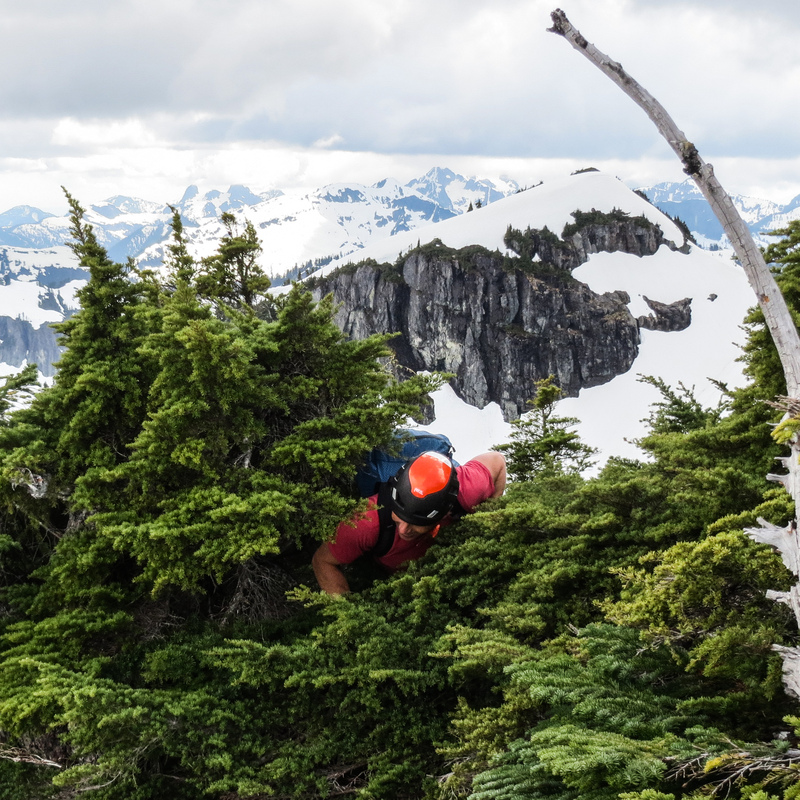 Ascending party to a large bushy treed ledge, then traversing the ledge around the climber’s right side, takes you to the East Ridge. Mostly 3rd class with one steep rock step that requires a move. Unpleasant in mountain boots. Descend by retracing steps along the ledge to snow slopes. A very non-prominent unnamed summit between Ledgeling and West Nai. From scree slopes below the S side of Ledgeling, traverse skiers left passing one couloir. 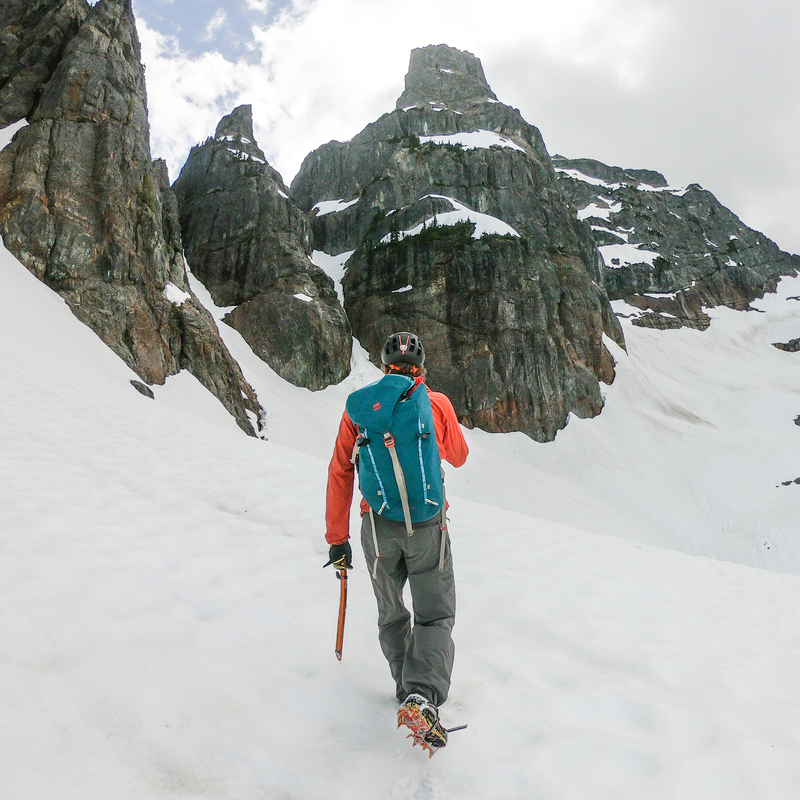 Take the second couloir up to it’s top to find a 4th class groove leading up the West side. At the top of the groove is a block that must be mantled (30m). Continue up broken rock (3rd class) to the summit. Descend towards the Nai with a short walk down snow or heather slopes on the East side. Short 3-4th class grove on decent rock leads to bush which must be swam through to the crumbly rock summit. Descend snow or crumbly rock on the East side to get to the Nai Couloir. 4th class gullies with very loose rock lead to a short bushy section and the summit. 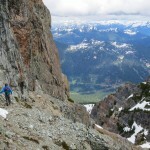 Descent to the Ledge basin is easiest in early season by down climbing the Nai couloir. If this appears impractical, it may be necessary to reverse back over the W Nai and onto the southern slopes to traverse back to the South Ridge of Sky Pilot (much longer). 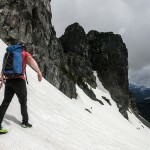 This entry was posted in Trip Report and tagged Aerobic Alpinism, Alpine Climbing, Ledge, Mountain Running, Sky Pilot, Traverse. Bookmark the permalink.